Great pyramids of orange await us now, in the aisles of grocery stores and piled high along the roads in front of farm stands—it's pumpkin season again. More than three centuries after the Indians first showed Captain John Smith how to grow it, pumpkin is still regarded as an incredibly versatile ingredient. Many of our present-day varieties have been growing in the Americas for close to 5,000 years. It is little wonder that in 1683 a Colonist rhymed: "We had pumpkins in the morning and pumpkins at noon. If it were not for pumpkins, we'd be undone soon." After arriving at Must Pumpkin Always Be Pie? I learned that pumpkin was indeed one of the foods that sustained the pilgrims during the early years in the New World. The pilgrims loved the spicy English savory meat pies, and pumpkin was a perfect ingredient to use in making them, along with the spices they had always loved and had begun to import. Pumpkins have been cultivated since ancient times in Europe, the Middle East and the Americas. The word "pumpkin," though, goes back only to the 17th century, deriving ultimately from the Greek for melon, pepon (the earlier word we used was pompion). This means "cooked by the sun"—ripe, in other words. The French potiron, originally meaning "hugh mushroom" (from the Arabic word for morel mushrooms), settled down to become pumpkin only in the 17th century, the century of Perrault and his tale of Cinderella and her coach. The older French word, still used by farmers in remote parts of France, is citrouille, referring to the citrus yellow color. All derivations lead to the sun and all recipes come from climates hotter than ours. Pumpkin belongs to the Cucurbita pepo species along with other winter squash such as delicata, acorn, turban and spaghetti. They are a mature fruit—one of the largest in the gourd family—and always cooked. They are planted in summer, harvested in summer or fall, and called "winter." Terminology like that was never meant to confuse—it simply dates back to a time when the seasons were more crucial to man's survival than they are now. "Good keepers" became known as "winter" vegetables if they could be persuaded to hold up even through December, and hard-shelled squash do their duty well, although fall is their peak season. Most varieties of winter squash require warm days to ripen in the field after being cut from the vine. Some varieties will also need to cure in storage for four to six weeks before they are at their best for eating but pepos variety, which are generally yellow-fleshed, require little or no curing time after the initial ripening period. They are also, however, the first to fade, losing their flavor and becoming fibrous after three or four months in storage. Most pepos pumpkin varieties are rather disappointing when cooked and used alone in recipes calling for pumpkin. A much richer flavor will result if pumpkin is combined with delicata or butternut squash to boost its flavor. To roast squash, cut it in half. Scoop out the seeds (roast these if desired— recipe follows) and place cut side down in a large Pyrex dish filled with about 1/8" of water. Roast uncovered in a 350ºF oven until tender, then scoop out the flesh, puree in a food processor and use as desired. To estimate yield, plan on obtaining approximately 3/4C of puree per pound of whole pumpkin. A University of California at Davis study of 25 vegetable crops found winter squash to be among the most nutritious, rivaling cabbage, carrots, potatoes and spinach. It is a tasty source of complex carbohydrates and fiber and provides potassium, niacin and iron. The orange flesh is very high in beta carotene, the source of vitamin A; the deeper the color, the higher the beta carotene content. In fact, of all canned fruits and vegetables, pumpkin is the best source of vitamin A: a half cup has more than three times the daily U. S. recommended daily requirement. Winter squash are also low in sodium and in calories, ranging from 29 to 43 calories per 4-oz. serving. There are two types of pumpkin available in the market. The first is the field pumpkin, which has a very mild flavor. These pumpkins do tend to be tough, stringy and tasteless, but they grow tremendously large with pretty shapes and strong, durable walls, and are therefore perfect for Halloween jack-o'-lanterns. Of course, if the messy process of pumpkin carving gives you the shivers, you may want to visit Virtual Jack-O-Lantern and enjoy the wonderful world of pumpkin carving online—you will need a VRML viewer like VR Scout to view your results. (If you would like to learn more about the history of Halloween itself, you might visit The Origins of Halloween. The second type, the sugar pumpkin or cheese pumpkin (so called because its paler color resembles that of cheese) is grown for cooking and baking purposes has a more pronounced flavor. If you are looking for an eating pumpkin, choose one that's small (4 lbs. or under), light, golden orange and squat in shape. Whatever type of pumpkin you choose, make sure that the stem is still on and that the shell has no cuts or breaks. Look for sturdy, heavy squash with fairly glossy skin that is unblemished by soft spots or uncharacteristic discolorations. Pumpkins will keep for long periods of time in a cool (50-55º F), dry, well-ventilated place. Never refrigerate them or leave them outside in the cold. Plan to use pumpkins stored at room temperature within two to three weeks. Once a pumpkin is sliced up, however, flavor and nutritional value rapidly diminish, and mold can appear in a few days. Don't worry—it is worth buying a whole one to make a magnificent Halloween lamp or tureen for a stew or soup. The surplus flesh from the hollowed out pumpkin can be cooked in a small amount of water (just enough to set it going), drained and stored in the freezer for a later use. An inexpensive and plentiful food as well as a most desirable fall cooking ingredient, pumpkin lends its distinctive taste and smooth texture to a variety of both savory and sweet preparations. 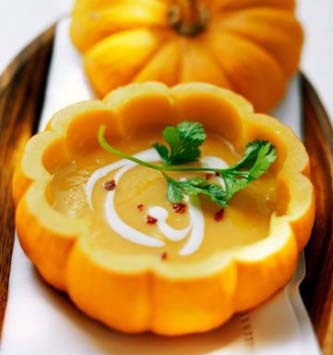 Enjoy the full rich taste of it in a hearty pumpkin soup (recipe below) and the velvety creamy texture of it in a delicious warm spicy pumpkin pudding. Slice off the stem end of the pumpkin 2-1/2" from the top, reserving it, scrape out the seeds and the membranes, reserving the seeds for toasting as described below. Brush the inside of the pumpkin with 1-1/2 Tbsp. butter, melted. Top the pumpkin with the reserved stem end, bake it in a shallow baking pan in the middle of a preheated 375ºF oven for 1-1/4 hours, or until the pulp is tender, and let it cool in the pan until it can be handled. In a large, heavy pot cook the onion in the remaining 1-1/2 Tbsp. butter over moderately low heat, stirring occasionally, until it is softened; add the carrots and sauté lightly, then add the stock and bay leaf and simmer the mixture until the carrots are tender. Discard the bay leaf. Discard any liquid that may have accumulated in the pumpkin and scoop out the pulp carefully, leaving a 1/4" thick shell. Puree the pulp in a food processor with the carrot mixture in batches, transferring the mixture to another pot as it is pureed. Add the cream and bring to a simmer. Season with salt and pepper to taste. To serve, heat the pumpkin shell if necessary in a preheated 375ºF oven until it is warm, and ladle the soup into the shell. Grate the top with a little fresh nutmeg and serve hot. Remove any fibers from the fresh seeds and spread them on a baking sheet to dry overnight. Toss with the oil and bake them in the middle of a preheated 350ºF oven, stirring occasionally, until they are golden and crisp, between 15 and 20 minutes. Pat with paper towels, sprinkle with coarse salt and enjoy.